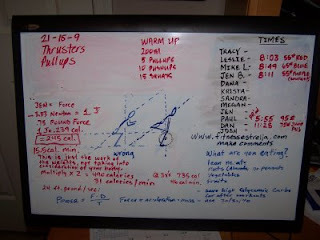 Refer to Saturday July 11, 2009 for correct form of the Thruster. Thanks to Mike for taking great shots. 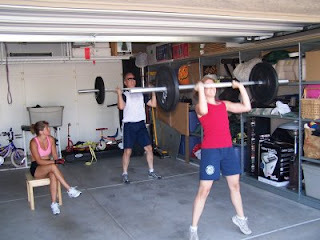 Mike and Jen doing Thrusters! 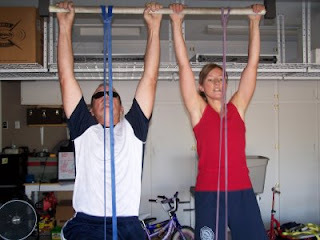 Mike and Jen doing Pullups! Leslie with excellent form on the Thruster! This was a harder workout then it looked!!! My arms are still hurting...lot harder then looks. 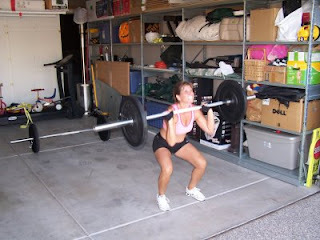 Did this workout Saturday June 11, 2009. OK, I hate this workout. It is the most dreaded workout for me. Thank you Mike and Leslie for pushing me. I consider this a PR for me. It seems that everybody is setting PR's and we haven't even been doing this for 2 months. Congrats to Mike, Leslie and Jen for crushing their times from before and using heavier weight and smaller bands. That felt good, even though I was exhausted.